This tutorial will tell a partition tool which is available for resolving problem about low disk space on system partition in Windows Server 2008. Download IM-Magic Partition Resizer Server to resize system partition that runs out of disk space on Windows Server 2008. What can you do when system partition is running out of disk space on Windows Server 2008? All you need is a professional partition tool IM-Magic Partition Resizer Server. This partition software allows you to resize hard disk so that you can reallocate some free space to system partition when it is running out of disk space. This partition software can work on Windows Server 2008 and other Windows Server operating system. By using this software, you can resize NTFS and FAT system partition or data partition with no influence on operating system or disk data. 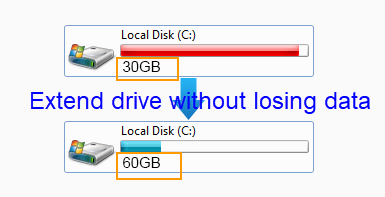 Move the arrows to shrink the selected partition so that you can create some unallocated space. You need to move the unallocated space close to system partition. Then, right click the system partition and select "Resize/Move" option. "I have a 500GB Adata hard disk installed on my Windows Server 2008 computer. When installing the hard disk on my computer, I only allocated about 30GB space for C drive system partition and now it is running on low disk space. When I boot my computer, Windows Server 2008 pops up low disk space warning message and asks me to delete some unnecessary files. How can I resolve the system partition low disk space problem on Windows Server 2008 except deleting or moving files?" "Well, system partition on my PC which runs Windows 2008 operating system is running on low disk space. The Extend Volume under Disk Management to extend system partition is grayed out. Is there any other method to extend system partition on Windows Server 2008?" If Disk Management failed to extend system partition on Windows Server 2008, you can resize the hard disk by relying on the partition software. 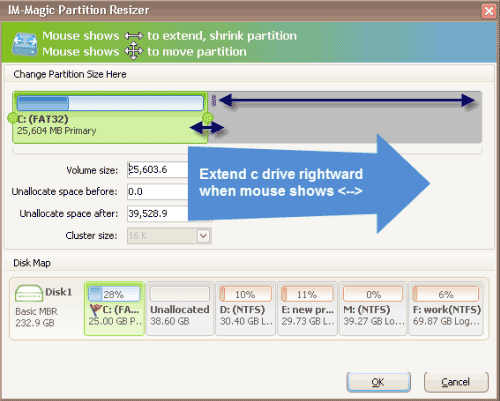 IM-Magic Partition Resizer Server can help resize hard disk and redistribute disk space without repartitioning. You can run the software to squeeze unallocated space from the partition that has lots of free space and then add the unallocated to system partition to get it extended. This partition software is reliable and secure, which does not touch any data stored on the disk during partition resizing. It does not affect the performance of your computer due to partition resizing with this partition software. In addition to Windows Server 2008, IM-Magic Partition Resizer Server can work on all Windows Servers such as Windows Server 2003, Windows Server 2003 R2, Windows SBS 2003, Windows Server 2008 R2, Windows SBS 2008, Windows Server 2012 and more. You can resize system partition C drive without reinstalling system or resize data partition without touching any disk data. You can not only move free space from data partition to system partition, but also you can move free space from system partition to data partition. This partition software also enables you to extend system partition on RAID 5 without rebuilding the array. 1. You can rely on Windows Disk Management to resize hard disk on Windows Server 2008. If you meet the problem that Extend volume under Disk Management to extend system partition is greyed out, probably there is no adjacent unallocated space beside the system partition. 2. You can uninstall some programs or delete some unnecessary files to free up disk space on system partition. You should be careful when deleting files from system partition, because the deleted files might be system related. If you mistakenly delete some important files which is system related, it may cause trouble to the operating system or have influence on the performance of you computer. 3. You can run Disk cleanup tool to free up disk space on the system partition, but this can only free up little space.